Hello there, with so many photo booth companies, it can be quite stressful to be sure you're booking the right one. While some companies are better than others, you, the renter, deserve to have the necessary knowledge to weed out those that are not worthy of your hard earned mullah! 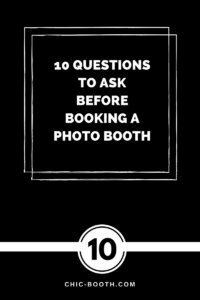 Our Chic Booth team created a list of questions you should ask before you book a photo booth. The goal is for you to be as educated as possible so you can make the right choice. 1- Is your booth enclosed or open? It's important to understand the difference between the two. An enclosed booth includes a structure with the camera, backdrop and props inside, giving you more privacy. 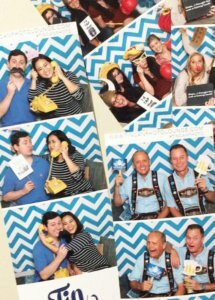 Meanwhile an open-air booth consists of the camera, backdrop and props, this option allows the photo booth to be a part of your event. Each type has its advantages and drawbacks. It’s a matter of preference. Read our Open-air vs Enclosed Photo booth post to better understand the difference between the two before booking. 2- Are the props free? Some companies will provide props as a part of the services while others will make you pay extra for the props. We’re not saying this is bad practice, just that you should know about it. You may also ask if they can make you some personalized props, including hashtags or printouts of your face. 3- Can you customize the printouts? The answer to this question will often be yes! Be sure to follow up with “How much will it cost?”, “Will I have to use some of your templates or can I customize them?” and "How many pictures can I have per printout?" The company should be able to send you samples before your the event. Make sure your printouts are exactly what you want. 4-What size are the printouts? The two most common printouts sizes are 2×6 and 4×6. Some companies only offer the 2×6 option, some will upcharge you for the 4×6 and some others will let you choose whichever size you want, without a fee. 5- Is your unlimited printing really unlimited? What? Many companies out there will tell you they offer unlimited printing. Funny enough, that doesn't always mean that everyone in a photo will get a printed copy, some might do a single printout per session. Don’t ask us why they call it unlimited, we don’t know either. 6- What comes standard with every package? This one is a basic question. Before booking you need to know everything you’ll be getting at the listed price. A low price can sometimes mean hidden cost or poor service offerings. A list of services provided should be given to you. Here you can see the list of our packages. 7- What takes the pictures? A camera, duh! The real question is: what kind of camera? Some photo booths use the camera of a tablet while others use a professional camera with a studio flash and light. Prices will vary between the two, but so will quality. The choice is yours. 8- Can I see myself before taking the pictures? We were surprised to learn that a lot of photo booths out there don’t show you a live view of the pictures before they are taken. Is it necessary? That’s up to you, but keep in mind that nobody wants a piece of broccoli on their tooth to be in a picture forever. 9- How many people can fit in one shot? This is where enclosed vs open air booths matter. Choose wisely based on how big of a group you want in your pictures. 10- Will there be an attendant at the booth? While most booths don’t need one, some companies will assign one or two to provide the best experience for your guests. Some other will have one available in case something goes wrong. And some will leave the booth unattended. It’s a good idea to know what to expect. If you ask this question inquire about the dress code as well. Thanks for advising us that we ask what comes with a normal package since we’ll want to know what is included in the basic price. My fiance and I have decided that we want a photo booth for our wedding, so we are wondering how we should go about it. We will definitely have to ask what will come in our photo booth’s package so we can be sure we get the biggest bang for our buck. My friend is getting married soon, and she really wants to have something fun at her reception. We thought a photo booth could be fun. Thank you for all the questions we could ask a photo booth. That is good to know that there are multiple printout sizes that we could have. We will have to ask what sizes they offer. Thanks for the tip to check if a photo booth will let you see yourself before the picture is taken. My little sister is going to get married, and she would like to get a photo booth for the reception. She is always asking how she looks, so it might be best to keep an eye out for a photo booth that provides a live view for the wedding. Thanks for the tip about asking what type of camera is used in the photo booth since it can be an iPad or a professional camera. 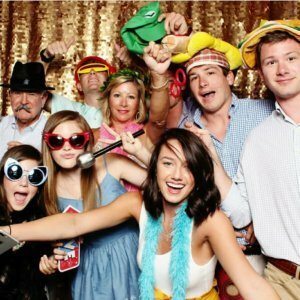 My daughter will be getting married this fall and we were thinking of renting a photo booth for her wedding. I’ll have to ask the different companies what type of cameras they use to see who we want to hire. I like that you mentioned how some companies will include props with the photo booth rental. This is something that you wanna ask about. If they don’t include some or not enough, you can always get some from a third party.